How Lou Sees It: The Holiday Season is Here, and so is Holiday Fluxx! The Holiday Season is Here, and so is Holiday Fluxx! 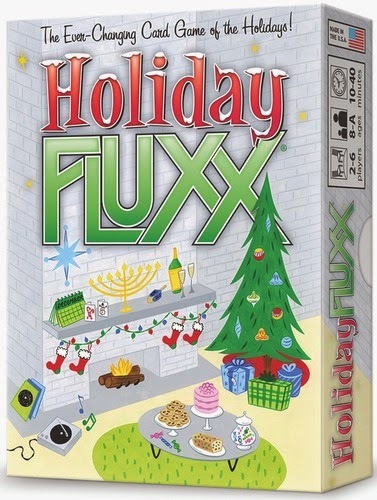 Holiday Fluxx is one of the newest themed Fluxx decks available from Looney Labs. The general idea behind any of the Fluxx games is very simple. Fluxx is a hand managment game that is constantly changing. Not only are your cards changing, but players are changing the rules and even the goal of the game constantly. A very fun concept. It keeps the game very variable and interesting. The game is not complicated even with all this change. The base rules and idea of the game (again, these can be changed or modified throughout the game) is that you draw a card and play a card each turn. The goal cards can be played to the center of the table one on top of the other - with the one on top being the current goal of the game. If a player meets that goal, they win the game. Usually the goal cards just list what cards a player must have played in front of them in order to win. Players have Keeper cards which are cards necessary for certain goal cards and Creeper cards (only in certain versions) which usually inhibit you from winning until you get rid of it (or it may be required from a goal). Action cards allow players to add more chaos to the ever changing game. You may be drawing 4 cards at the start of your turn but you may have a rule that limits you to only 2 cards at the end of your turn. A very intriguing concept for a game and one that can be very fun. It can get long at times, but hopefully you are in no rush and you are just enjoying the game. The game isn't really what I would call a strategic game by any means, and there is quite a bit of luck involved. A player may start with the required goal and necessary cards to complete that goal and win the game very shortly after starting, or you may change the game back and forth so frequently that it takes you an hour to finish the game. Very interesting. I'm a huge fan of this holiday season and I think that this is such a great addition to the Fluxx family. Looney Labs has many different themed decks including Monty Python, Zombie, Pirate, Star, and Oz to name a few. If this isn't the right theme for you, check out their other themed decks. Life is too short to remain constant all the time, so every once and a while you just need to change things up - a lot - and you can do it with Fluxx and that is How Lou Sees It!